We love weddings at 1-800-Flowers.com, so when two fellow employees tied the knot last fall, we made sure to get pics to share! All of the wedding flowers were designed by Louise from the 1-800-Flowers Carle Place florist shop. Whether you’re planning your own wedding, a friends’ wedding, or just love looking at them (like we do! 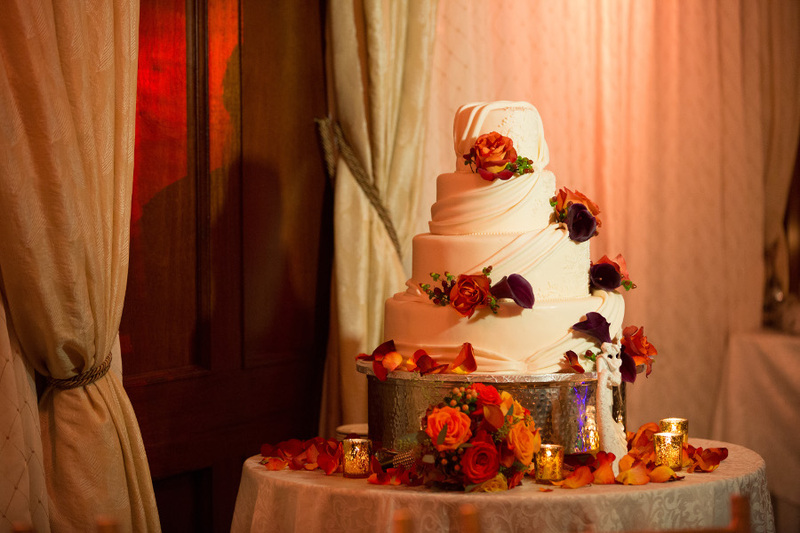 ), we hope that Brittany and Ken’s gorgeous fall wedding will leave you feeling inspired. 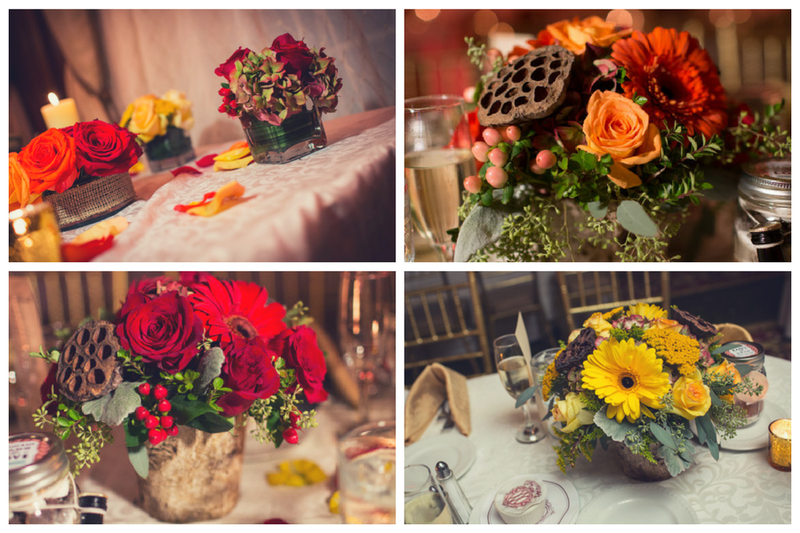 The color scheme for the wedding was true to fall, accentuating warm reds, yellows and oranges. 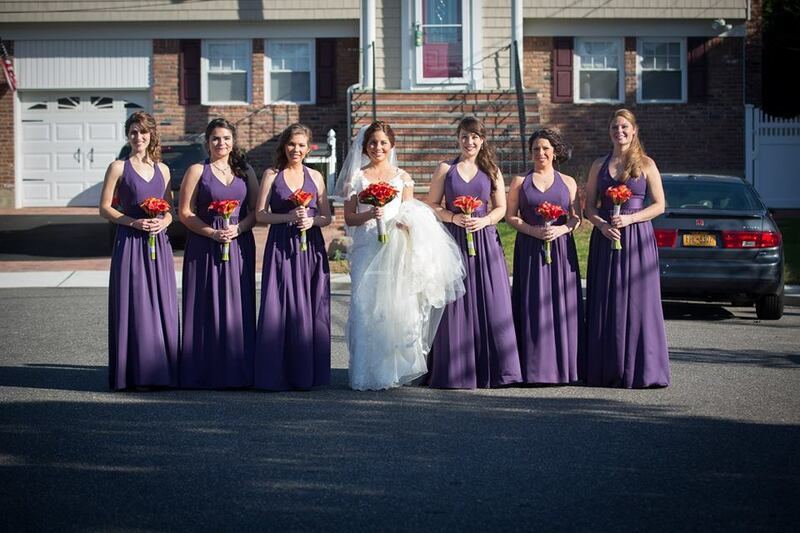 To compliment these colors, purple was chosen for the bridesmaid dresses. Brittany explained, “I loved the idea of a bold fall color. I know with bridesmaids dresses, I have heard people complain about it being uncomfortable or not made for everybody, etc… So I had all my bridesmaids come to the store and try on a few different dresses until we found one that everyone really felt good in.” All the effort surely paid off because the dresses fit into Brittany’s beautiful fall day perfectly! Brittany wanted her bouquet to be simple, yet elegant. Louise was able to create a bouquet that perfectly matched her style and taste. 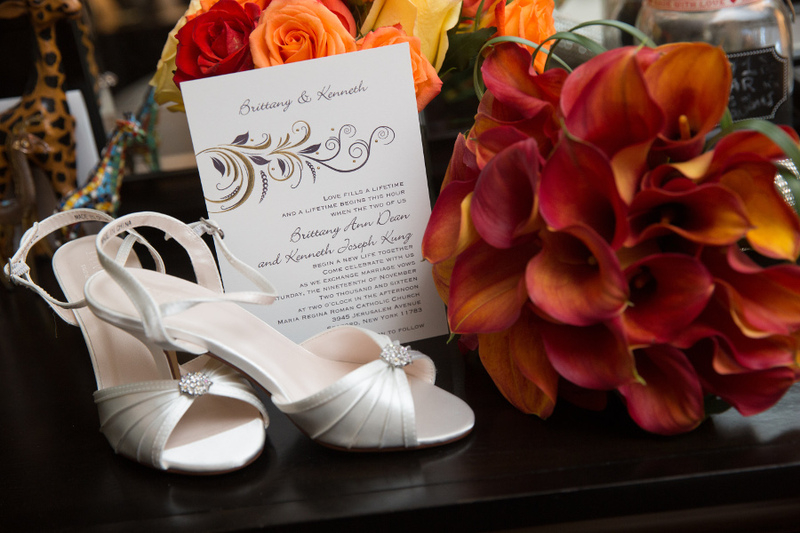 One of her favorite flowers is the calla lily, so her bouquet was designed around vibrant orange callas and accented with bear grass for a modern approach. 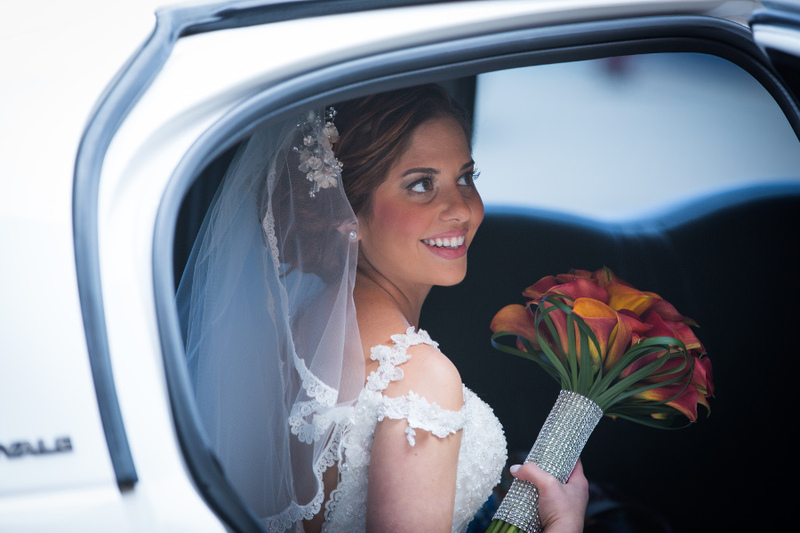 Her bouquet was accented with a bling wrap that gave just enough sparkle without taking away from the flowers. 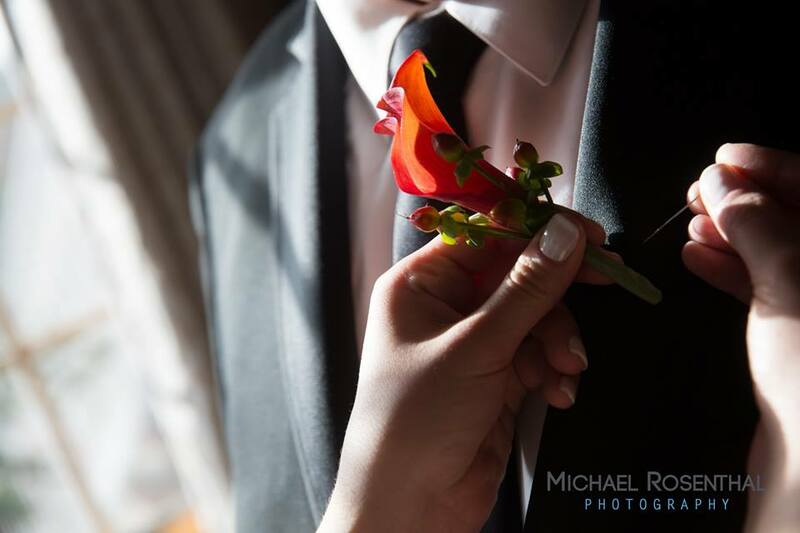 The bridesmaid’s bouquets and boutonnieres were crafted with orange calla lilies to match Brittany’s bouquet. The bridal bouquet stood out by only being slightly larger. The boutonnieres included fall berries (instead of the ladies’ bling) as accents! 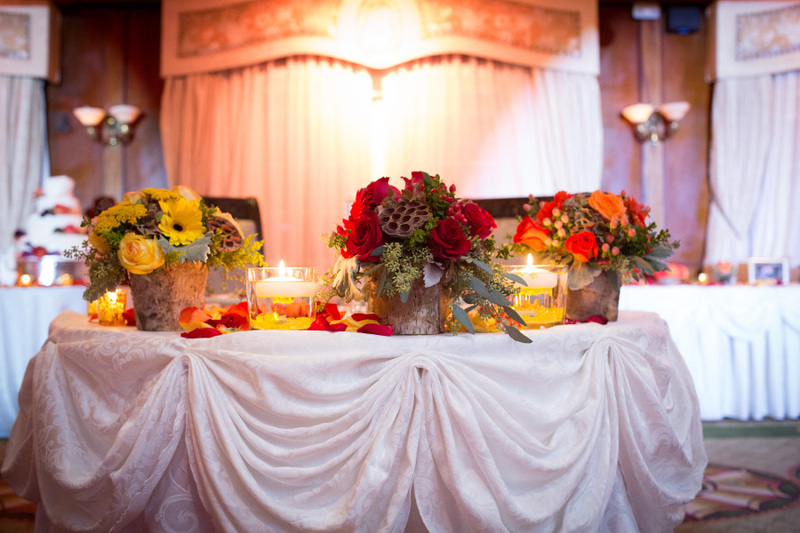 Brittany was able to fully trust Louise’s creative style for the creation of the centerpieces. She explained, “She has known me for four years and knows exactly what I like.” Louise designed three different types of centerpieces to go with each color in her wedding theme in a modern/rustic style. One arrangement was all red, one was all yellow and the third was entirely orange. All the flowers chosen were flowers specific to fall, with accents of green. The flowers sat in birch vases and used lotus for an extra fall touch. Since the tables were long and oval shaped, each table also had rose petals flowing down the table, along with floating candles and mercury votives. Do you feel inspired by Brittany and Ken’s modern rustic fall wedding? We sure do!